Many governments have learned the hard way that there is big difference between “Performance Management” and “Perception Management.” Often leaders assume that if they create a good performance management system it will be recognized and appreciated by voters for what it is worth and their popularity will go up. Alas, the causal relationship between the creation of a performance management system in the government and perceptions about the performance of the government is not as straightforward as it may seem. 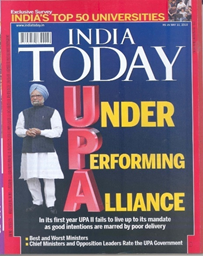 While the headlines appear bold, the magazine was modest while explaining its methodology. It explained that this was a perception survey and based on voluntary responses on an internet portal. These rankings were not based on data, facts or a representative sample size. As depicted in this figure, the reality according to the two methods was dramatically different. According to the government-run RFD system, departments were actually achieving 89 percent of the targets. But the perception of the government departments was that they were delivering only 39 percent of what was expected from them. The low statistical value of the Spearman Rank correlation (.02) confirms there was no correlation between the results reported by the two systems — one based on perception and the other based on facts (reality). One possible explanation for this dramatic gap between perception and reality could be the credibility of the government performance management system (RFD/PMES). While a perfectly natural and understandable first reaction, credibility of the system was not a factor as the government had failed to communicate the details of the system to the public. The Prime Minister had, in fact, decided to treat the first year of this system as a pilot. Unfortunately, he remained reticent about the value of the system till the very end. This, then, is the main crux of the explanation. 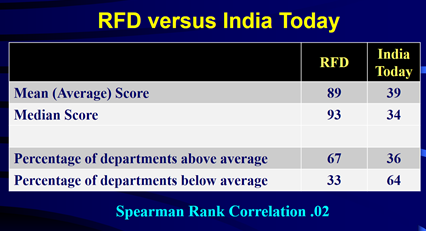 To be sure, the Indian government’s performance management system was in fact appreciated and applauded – but by international organizations (UNDP/World Bank), private rating bodies (Fitch), and India’s neighbors (Bangladesh, Sri Lanka, Pakistan, and Bhutan) – not by its own citizens. However, it was not properly communicated to the stakeholders. Hence, the main explanation for the gap between perception and reality was the absence of effective communication to the public by the government about its performance. Nature does not like vacuum, if a government does not communicate the facts, the space is quickly filled with speculation. Like elsewhere, in this area also there is a first mover advantage. Once the damage is done, it is difficult to repair it. That may in fact explain why the Prime Minister became forever etched as a non-performer in voters’ mind. While governments are beginning to understand the importance of communication, they are far behind their counterparts in the private sector in taking it seriously and making it a science. For example, communications and marketing are required courses in most business schools, courses on marketing and effectively communicating public policies are hardly ever taught in public policy schools. Most governments communicate only their achievements but not the journey towards those achievements. Take the example of two airplanes stuck on the tarmac waiting for the clearance from the traffic control to take-off. The pilot of one airplane comes on the public-address system and reassuringly explains the delay and offers a round of drinks on the house while waiting for the clearance. The pilot of the second plane does not do so. Both planes are in the same situation and are not moving, yet the passengers of the first plane are more relaxed and happy. Governments should learn a lesson from this parable and keep their stakeholders informed about the journey towards final results. If they do not, then citizens will assume the worst and feel nothing is happening. A good performance management system therefore reports on the achievement of major milestones in our journey toward the desired destination. It is an essential element of a communication strategy. Finally, public managers must remember that citizens’ views of the government do not solely depend on the government’s achievements of results. Public managers must also manage public perceptions of government performance as well, via engagement and communication tools. Two examples of such strategies that have been used successfully include Citizen Charters, which detail what citizens should expect in terms of service quality for specific services such as phone responses and time spent standing in line, and grievance redress mechanisms, which give voice to citizens’ concerns about how they are treated by government employees. To take the airline example, while two airlines may take us from point A to point B (same result), we prefer the airline that provides better customer experience and is more responsive to its clients.